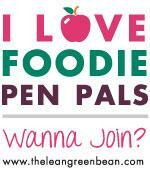 Today is Foodie Pen Pal Reveal! This month I was paired up with Sonja. She had recently visited New Orleans, so my box was full of regional NOLA favorites that she picked up while she was there! New Orleans is on my list of places to explore, so the package made me a little bit more excited to experience it first hand. I mean, sweet potato pancakes and waffles??? Too much! She also shared some recipes from the New Orleans Cooking School where she took some cooking classes. What a neat idea for a vacation activity! Thanks, Sonja for adding some spicy flavor to our kitchen! It is pointless to pretend that I have anything else going through my head right now. Also, thanks to some alert blog friends, I realized that I can check the weather report multiple times per day for updated forecasts! Right now race day is looking great! However, I’m a bit worried about the 36 degree temperatures on Saturday night. It might be a very very cold pre-race experience. We have added a trip to Goodwill to our to-do list for this week, because my little Lulu outfit isn’t quite enough to keep me warm if it is near freezing. I was good this wedding weekend and tried to keep marathon talk to when people asked me about it first… That’s a lie. I snuck it into a few conversations! But I did make a huge effort. But now we are down to business. We did our final 8 mile run this weekend. I was taking it very easy, but did the last miles at marathon pace, and felt ok. I’m having some pain at a weird spot on my upper calf/under knee/side shin area that I never knew existed. After some analysis, it seems that my IT band is so tight that it is pulling stuff (muscles? ligaments? I’m not too sure), causing pain in a whole different area. As long as that’s the problem, I can hopefully fix it in the next couple of days. Apparently weird pains are another symptom of the taper madness. FUN. I remember when I used to dream of the taper. Now I just want it to be over. This week we have 3 really easy workouts, and then after Wednesday we are done aside from a shake out 2 miler the day before race day. So, this has all the makings of making me EXTRA crazy. I should be a ton of fun to hang out with this week! Literally all I can do now is my mental workout routine. I must make the decision to keep going and push through pain since now, because I’m fairly certain that when it comes to miles 20-26.2, I won’t be as dedicated to anything spur of the moment. The more I prepare now, the more likely my body will follow on race day. At least, that’s my hope. Back in January, right before Rock and Roll Arizona, I was trying to talk myself into a good race. I hadn’t trained as well as I wanted to (I think my longest long run was 8 miles). THEN homeboy scaled a 65 foot wall to get out of the cave and deliriously hiked for 8 miles with his self-amputated arm before running into somebody who could help him (Lord knows how long he had to wait to actually be rescued after that). If he could do all that, then surely I can run through 13.1 miles of muscle tightening, side stitches, stomach discomfort, and blistered feet after not training into it. (Since I haven’t done the adequate physical training to run a 1:40 half, I’ve been doing a lot of mental training for it!). I also remember a lady who pulled her groin in the early miles of the RnRAZ marathon, and STILL came in 3rd overall. She literally couldn’t walk up the stairs to get her award. She was in pain. A lot of pain. I can’t even imagine what it would be like to run that fast and that long in complete agony. It makes my little battle to run moderately fast miles (hopefully without a pulled groin…KNOCKS LOUDLY ON WOOD) seem insignificant. So, when I’m struggling to keep going, I will remember Aron and his 8 mile walk with a freshly self-amputated arm and the lady who came in 3rd despite after pulling her groin They experienced pain far greater than what I will be experiencing, and they kept going. Good looking couple! and you’re so funny and completely the opposite of me. I’ve been avoiding the marathon talk as much as possible. I’m just so exhausted even thinking about it! Good luck with your runs this week! Haha! Thanks! We showed up to the pre-wedding stuff separately, and I was kind of surprised to see that his tie matched my dress! It is exhausting to think about the marathon! I kinda don’t have anything else to offer up to conversations though! Good luck to you this week too! Are you going to be getting the same cold front as Chicago? Yes — but not to the same degree. Right now it looks like a high of 52. Sounds OK to me! Enjoy this week! You’ve earned every bit of rest and relaxation leading up to Sunday! I’ve enjoyed following your marathon journey, and I’m really looking forward to reading your race recap next week! Thanks for following along! I hope to not disappoint on Sunday! I’m sure it will be very sad. This is terrible, but all weekend, I just kept comparing my marathon to my friend’s wedding. So much prep work and anxiety for a short event, and then it’s over. I skimmed through your recap this morning, but I will actually sit down and read it a bit when I get a chance this evening. Lol ! I think preparing for your first marathon is pretty close to a preparing for a wedding ! I usually think about my parents battling health issues..chemo..surgery etc..and then I think what a whiny wuss I am..and that usually works..and also there’s the glory at the end:). EXACTLY! Like, I’m complaining because my feet hurt when so many people have real problems that won’t go away after a few hours? Definitely humbling. I’m also at the age where a lot of friends are having babies, so I keep thinking that at least I’m not in THAT much pain for 36 hours. I’m thinking I might stick with “GO” in case “one foot in front of the other” gets too complicated! I could see my brain twisting that around to “front feet other feet.” I’ve heard that you also start having thoughts unlike anything you’ve ever thought before. I’m kind of looking forward to what weirdness my brain comes up with under the stress of 26.2 miles! Haha. Yes, “GO” seems easy enough! I wish there could be someone to document all of the weird thoughts at the end. It would be a trip. Great attitude! I know you will do great. You’ve made it this far, now it’s just mental. Sending you happy, positive thoughts!! Thank you, thank you! Someone told me the other day that 3/4 of the work is done. It helped me realize that my marathon is much bigger than the final 3-4 hours! AwwwWWWWWwwww…look at how cute you two clean up…totes adorbs. Good luck this week and you guys will do awesome, you’ve done the mental and physical work! Haha! Thanks! The weird thing is, I kinda don’t think that looks like me at all. BUT I figured it was impolite to make the person take multiple pictures until I was happy with one. (and I’m not going to lie…picturing real life Dominick saying “totes adorbs” makes me giggle a bit). And I’m also trying to stay more calm for your sake, so you don’t go around accusing me of making you anxious! But really though, thanks for always being such a big supporter! It’s more of a stretch to envision me saying AWWWwWwwwWWWw…It’s ok to be anxious…I completely understand…I will be a wreck the last week regardless, I am sure of that. A good mental attitude is the best first step! I love that you compared it to 127 hours. That guy is made of steel! He is! The whole time I was watching that movie, I kept thinking, wow, I don’t know if I could do that. He helped me get through a good half marathon…let’s hope he can get me through this!